A strong thunderstorm moved through Sarasota, Fla., over the weekend, but it did nothing to dampen the spirits of those attending the annual Bumpy Jones Classic. The meet is known for featuring numerous world records, and that tradition continued this year with four Masters relay world records and an individual mark for Rick Walker. After a rain delay moved the 800 free relay to the end of the meet, the North Carolina Masters claimed their first world record with a stunning 4:41.71 in the 400 medley relay. After Braun’s backstroke leadoff of 1:10.09, Kerry Lindauer followed up on breaststroke. Alicia Uhl kept the pace on butterfly, with Jen Stringer providing a strong freestyle anchor. The time shattered the previous world record of 4:47.03 swum by Japan’s Ryogoku Kingyo in 2013. The United States Masters Swimming record of 4:56.33 by San Diego Swim Masters also didn’t stand a chance. Next up was the 400 free relay, where a 1:01.25 by Braun on the leadoff was just the beginning. Stringer, Uhl and Lindauer followed to combine for a 4:06.90 that took down the world record of 4:17.76 by a Russian team called Tsunami from 2011. It also beat the USMS record of 4:12.60 by Illinois Masters from 2009. The foursome finally got to swim their 800 free relay on the third day of the meet, and posted a 9:18.33. Canada’s Edmonton Masters team had the previous world record, a 9:32.42 set almost exactly one year ago. The USMS national record of 9:36.88 by Mission Viejo Masters had stood since 2009. The North Carolina squad got within a second of the world records in the 200 medley relay and 200 free relay. Their 1:49.33 in the 200 free relay missed Team TYR’s 1:48.44 from 2006, while the 2:04.84 in the 200 medley relay fell short of the world record of 2:04.75, also by Team TYR from 2006. The host club also got in on the world record-setting action. 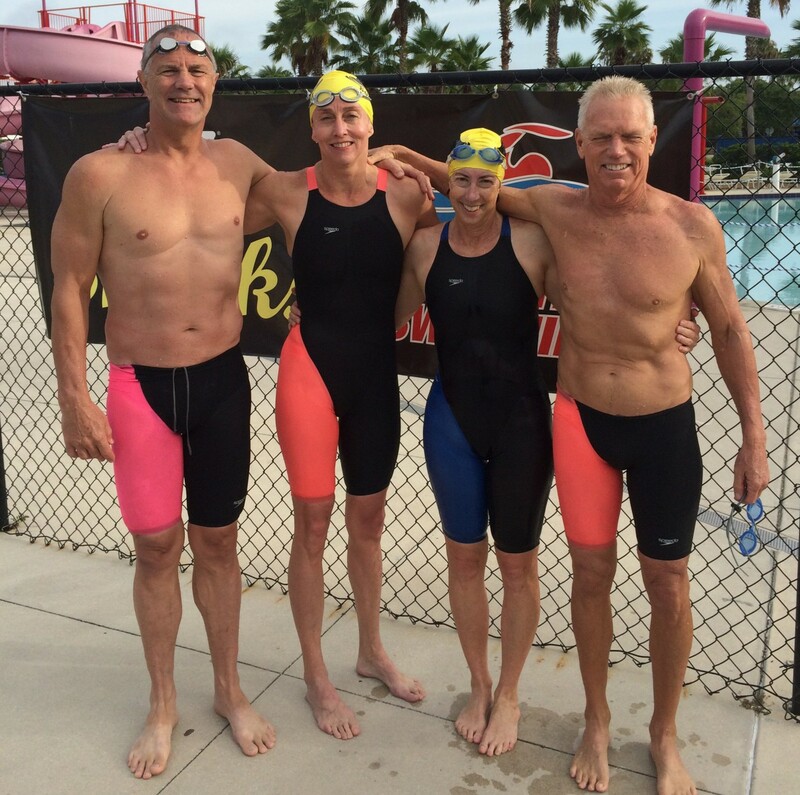 Representing Sarasota Sharks, Jack and Laura Groselle teamed up with Rick Walker and Nancy Kryka to post a 10:04.83 in the mixed 800 freestyle relay for the 240-279 age group. The time got under the previous mark of 10:09.67 that had been set by Tamalpais Masters in 2010. Kryka and the Groselles had set a world record in the mixed 400 free relay at last year’s meet, but that record has since been broken. Walker, who is also the head coach of Sarasota Y Masters, claimed his first individual world record in 10 years with a 4:58.71 in the 400 free. The time breaks Tom Landis’ eight-year-old record of 5:00.26, and makes the 65-year-old Walker the oldest man under five minutes in the event.